Rollercoasters. I love them. Well mostly. 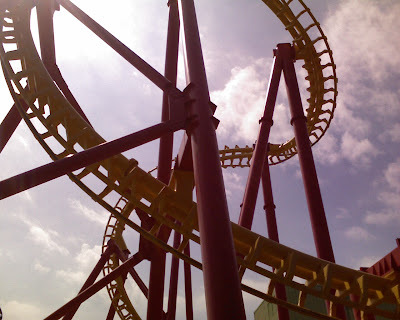 I am more of a good old fashioned rollercoaster gal. Put me on one of those wooden rollercoasters, the ones that slowly click clack up a huge hill and then race you down at high speeds. Now these newer, wilder, crazier the better rollercoasters? Do I like those? Notsomuch. 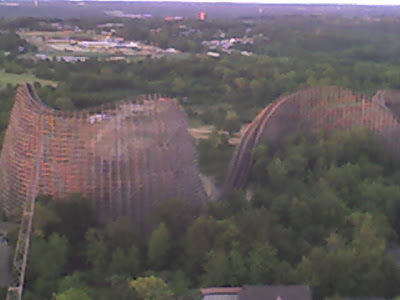 I had a chance to ride dozens of these rollercoasters this past weekend when Bill and I made a kid-free trip to Kings Island to celebrate our tenth anniversary. We couldn't wait to go and ride all of the rides, without any worry about tired fussy children in big crowds and hot weather. We told each other we'd take our time, ride what we felt like riding, when we felt like it, and just enjoy each other's company. 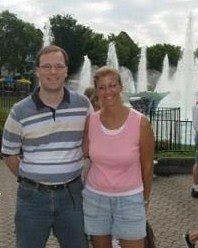 We arrived about 45 minutes after the park opened and headed towards the first coaster we could see - Invertigo. Now that has got to be the most appropriate name for a ride I've ever heard. I had plenty of chances to back out, but tortured myself anyway. I watched this ride over and over again- the line for it actually weaves its way RIGHT UNDER the rollercoaster, so you get a good sense of what you are in for. You think that would have given me second thoughts (or third or fourth ones), but common sense clearly was left behind with the girls and Grandma. 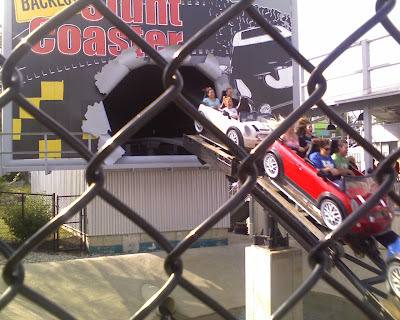 In case you have never had the torture pleasure of riding this ride, here's the description from the Kings Island website: "Sit back and witness the terror flash in the eyes of your fellow riders as you experience the only face-to-face inverted roller coaster in the Midwest! 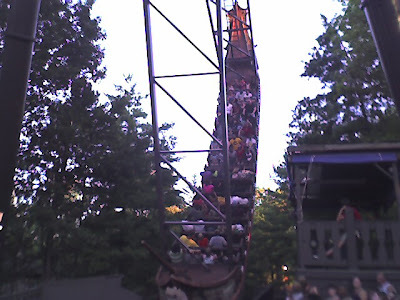 Scream your face off as you are lifted up a 138 foot hill and then released to soar through a 72 foot tall loop and two inversions at speeds of over 55 mph!" Scream your face off? Ummm, for me it was more like "cry for help"! And I love how they say "sit back and witness the terror flash in the eyes of fellow riders". Like you can even see them, much less anything else! Let me just say that by the time the ride was over (in about two minutes flat) I didn't know which way was up/down. I've always wondered what it was like to have "vertigo" and now I absolutely know. Not a great feeling I must say. People were getting off the ride and cheering and I wanted to puke. And THIS is supposed to be FUN? I think not. I was also "brave", despite my experience with Invertigo, and rode the Vortex. 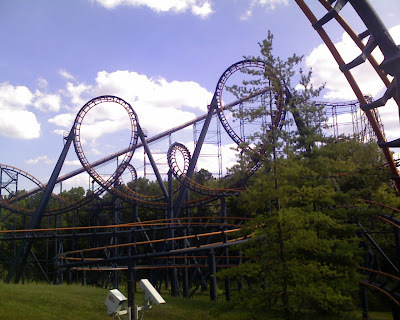 Crazy ride (six inversions! ), but I survived it! 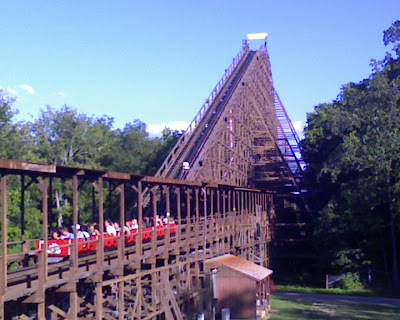 I loved the Son of Beast - definitely more my style. HUGE hill and super fast going down. Two years ago that ride had a big loop in the middle, but due to people getting injured structural problems, they took it out and rebuilt that section of the rollercoaster. The ride is much smoother now, thankfully! And then there was the Beast. I LOVED the Beast when I was nineteen years old. 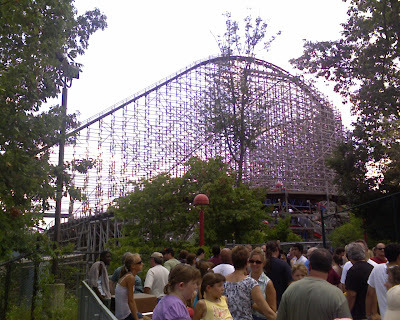 I rode that coaster 3-4 times in a visit if the line wasn't too bad. Most days I may feel like I am still twenty, but my body reminded me that I am clearly NOT. I was sore for three days after our trip. THREE DAYS! So, if you really are only as old as you feel, I'm 90 (for this week anyway)! I was too chicken to ride the newest, craziest ride in the park, Firehawk. 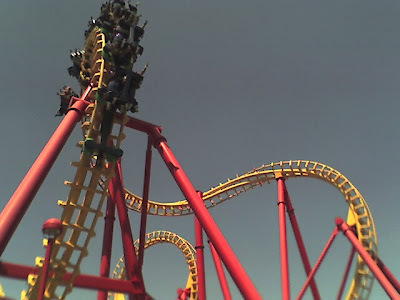 On this coaster you lie down and are facing the ground and "fly" over hills and inversions for a good part of the ride! All day I built up my courage to ride it because I knew Bill really wanted to. 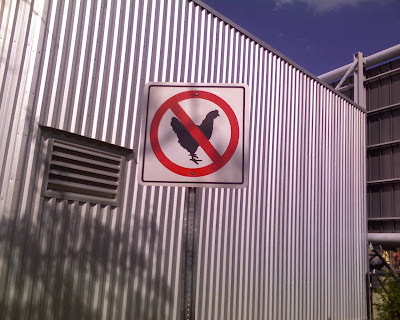 I kept looking at it, thinking about it, but couldn't quite get the courage. Finally, when I actually thought I might, we went over to get in line, only to find the wait was TWO HOURS! Bill loves the craziest of all rollercoasters and even he said, "NO WAY". So I lucked out this time. Yipee! Oh darn. Ha ha! I love your title! Glad that you had that "getaway", though. Yay! how many shades of awesome is this? Looks like you had an amazing trip! Winning Isn't Everything - Or Is It?